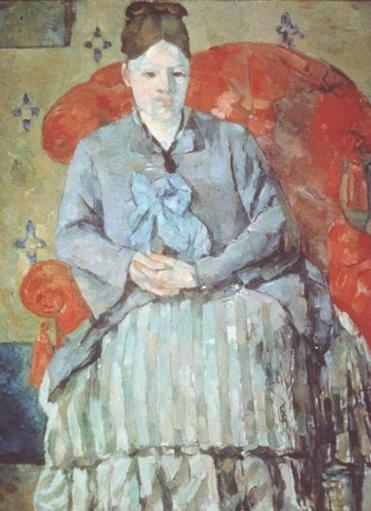 Alex Danchev’s insights into Cézanne’s life include the assertion that the artist’s wife (above in “Madame Cézanne in a Red Armchair”) has been unfairly maligned by other biographers. 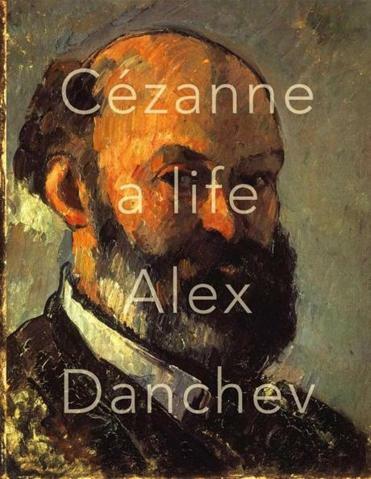 This learned and engaging biography by Alex Danchev, a University of Nottingham professor who also wrote a well-regarded life of Georges Braque, shows how Cézanne, with those amazing retinas, changed not just the way people see but the way we think about perception and the possibilities of art. His riveting portraits and still lifes made even Manet look a bit conventional in comparison. With his short, deliberate brush strokes and dazzling feel for color and volume, he found a way to make the inanimate come alive. “Cézanne made a living thing out of a teacup,” the abstract pioneer Kandinsky wrote. For most of his career, Cézanne was an artist’s artist. The first wave of Impressionists revered, imitated, and collected him. Monet owned 14 Cézannes, Degas seven, and Gauguin used to carry one of his six Cézannes to a restaurant to expound on its wonders to friends. Cézanne didn’t sell a painting to someone other than a friend or patron until he was 35, and his first solo show came when he was 56, in 1895. Danchev may not alter much Cézanne’s reputation as an eccentric, toiling figure, unappreciated by the public until very late in life, but he skillfully builds a flesh-and-blood context around him. The novelist Émile Zola looms large, first as schoolmate in Provence, where Cézanne ironically won prizes for composition and Zola for drawing. They were roommates and inseparable friends in Paris, as attested by Cézanne’s wistful portrait of Zola in 1866, but had a bitter falling-out over a struggling-artist character in a Zola roman à clef that some critics assumed was based on Manet but which Cézanne knew was him. The character hit too close to home. Danchev tells this haunting story of friendship and estrangement with poise and humanity. He sometimes misses its dramatic tension, however. Like some art museums today, Danchev plays down chronology and arranges things thematically. As with museums, the technique doesn’t always work. In one chapter, the action jumps from 1870 to the early 1900s and then back to student days in the early 1860s. The problem is not helped by rambling citations from famous writers whose only connection to Cézanne is a tangentially similar life. Kafka comes in for long treatments because he and Cézanne had difficult relationships with their stern fathers. Danchev puts his erudition to better use with accounts of the entrancing effects of Cézanne’s work on poets and painters like Rainer Maria Rilke, Allen Ginsberg, and Jasper Johns. And in a brilliant takedown, he asserts that Cézanne’s wife, Hortense, sitter for 24 of his oil portraits, has been maligned unfairly by previous biographers as a scold and a philistine. Her two surviving letters paint a picture of a sincere, if unschooled defender of her husband’s interests, he argues. Antipathy from Cézanne’s sister and friends might account for the entrenched ill will. After reinventing the landscape, Cézanne deconstructed it in his last years with a series of shimmering, chaotic views of Mont Sainte-Victoire massif in Provence. “The strokes become shreds; appearance is transmuted into apparition,” writes Danchev. His eyesight failing, possibly due to diabetes, Cézanne complained to a friend about seeing “overlapping planes” and lines that wouldn’t stay straight So his retinas might have been diseased after all. But without them, we might never have had cubism, abstraction, and beyond. Modernism was born.